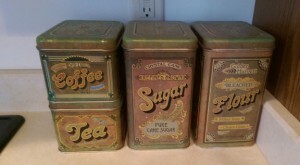 I’ve had a set of metal canisters on my kitchen countertop for many years, marked Coffee, Tea, Sugar and Flour. They gave the kitchen a cheery old-fashioned look, although I never really used them for coffee or tea. I leave teabags in the box they came in, and K-cups go on a carousel. The coffee and tea canisters have white rice and brown rice in them, respectively. I do have sugar and flour, but I haven’t done any baking in a long time because I’ve been cutting down on sugar to stay healthy. So I asked myself, why do I still have them? I really just need containers for rice. New boxes or jars for rice would make a lot more sense, while fitting easily into a cabinet too. The canisters are not much use for decoration anymore, now that they are full of dings and the lids are turning green. It’s definitely time to let them go, and reclaim my counter space! About Clutter Comedy: Every Sunday (which I envision as a day of rest after a productive week of de-cluttering) I post a Clutter Comedy article describing my most memorable clutter discovery of the week. Other bloggers who wish to join in are welcome—just post a link in the comments! There’s no need to publish any “before” photos of your clutter, if they are too embarrassing. The idea is simply to get motivated to clean it up, while having a bit of fun too! Haha! I can see a house guest going for the old-fashioned coffee and being confused when they open the tin 🙂 More counter space is heavenly! I love having a countertop completely free of clutter when I cook so I don’t have to navigate around stuff, and it’s especially nice for cleanup. No working around stuff to get rid of the crummies! Yes, much easier to cook and clean up without anything in the way! © 2019 Meg Evans. All rights reserved.